The Gymnic Classic Plus Pregnancy & Gym Exercise Balls are ideal for use when pregnant. They can be used for sitting on as they can be easier to get in and out of then a hard chair while pregnant. Using the Gymnic Ball for gentle exercise can improve posture and stomach muscles which can help the body to support the weight of your pregnancy. Using a birthing ball during labour has also been shown to help reduce the pain of contractions by helping the expectant mother to adopt different upright positions. 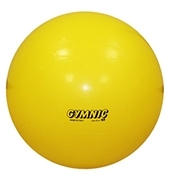 Gymnic Classic Plus Pregnancy & Gym Exercise Balls feature a Burst Resistant Quality system which deflates the ball slowly if punctured. The Gymnic Classic Plus Pregnancy & Gym is a Medical Device Class I.